Do you know how important you are to Him? Rom 8:32 He who did not spare His own Son, but delivered Him up for us all, how shall He not with Him also freely give us all things? What do you need, He has freely given it all in Christ!! I like this quote from Andre Rabe; When God thought of you, He thought of a way to uniquely be Himself – a visible form of His image and likeness … and His thoughts became flesh. Let this settle deep into your heart, God loves YOU! Don’t put your toe in the water of God’s grace, dive in, feast on it, you will NEVER regret it! What amazing grace!! Posted on May 31, 2013 Author EvanCategories Abundance of GraceLeave a comment on A Love That Fulfills! When our relationship is right, there is no need for the law. The law was only for broken relationships. Christ finished the work and included you in it, we now have a right relationship with God in Christ! Discover His love, His faith, and what He Believes about you! And recognize that His richest blessings are already yours. He wants you to walk in this freedom, and He wants YOU to reign in life! In “Do We Still Need To Offer Sacrifices And Offerings” Part 2 Evan explains why some Christians still feel obligated to offer sacrifices and offerings, even after Jesus was our once-for-all sacrifice and offering. Sin-consciousness and self condemnation are really at the root of Christians continually seeking to offer a sacrifice or offering to God, attempting to appease their conscious, or attempting to, (at least in their mind,) appease God. The finished work of the cross is the ONLY solution. God’s love always draws us to the place of rest, (Hebrews 4) because it is finished in Christ. All the work, and offerings, and sacrifices were completed in Him. Jesus was the sacrifice to end ALL sacrifices. Rest in Him, and realize that His richest blessings are already yours, so you can reign in life! In Him ALL The Promises Are Yes And Amen!! All the promises God has given us (health, provision, peace, abundant grace, righteousness…) whatever you need, it has been promised and provided to you, therefore in Christ the answer is yes. Don’t be fearful, fear chokes the word in your life, fully discover God’s love and grace for your life, and you will enjoy peace, and the “yes and amen” to all His promises. Many people have discovered a glimpse of God’s goodness and grace, and they say, “I want that, and I’m going to do whatever it takes to learn of, and grow in this grace,” only to return to their place of unrest because as Mark 4:19 says; “the cares of the world enter in, and choke the word, and it becomes unfruitful. That place of “unrest” is anxiety, and the cares of this world. God has prepared a place of perfect and perpetual rest for us, don’t let fear and anxiety (through unbelief) keep you from the “yes and amen” to ALL the promises and good life god has prepared for you. Hebrews 4 says they failed to enter God’s rest because of unbelief. They did not believe what God said about them, and they settled for a lie about themselves instead. They remained in unrest, or a better way to put it, unbelief, full of anxiety and fear. If you have been saying “I want to learn this, and experience God’s best,” then by all means jump in to His grace, find a place or get your hands on resources that will feed you this good news, jump in and taste the goodness of God; and watch your life transform as you enter His rest! There is no better place anywhere than the place of God’s rest!! Jesus finished the work, He paid it all in full! Don’t stand outside looking in any-longer, come on into His best, His rest! God’s richest blessing are already yours, so reign in life today! Posted on May 17, 2013 Author EvanCategories Abundance of Grace4 Comments on In Him ALL The Promises Are Yes And Amen!! How To “Plug In” To The Power Of God In Your Life! Christians always want the power of God in operation in their lives, and that’s a good thing. Don’t we all want that? We know God is all powerful. Powerful to heal, powerful to save, powerful in every sense of the word! Can we actually pin-point the source of God’s power for our lives? If we could, then we could go to that very source of power for healing, protection, provision, or whatever the need. God’s love for us, is where it begins, and God’s love is powerful. Like a bolt of lightning in the sky, it is charged with power beyond our capacity to imagine, however we need to somehow plug in to that power so that we can see it manifest in our lives. So that we can live the life God planned, and imagined for you and me, “the good life” as Ephesians puts it. Jesus said “I have come to give you life, and life more abundantly!” The literal translation of that verse says; “I came that one should have life and should have extra.” This word “extra” (abundant) means, according to Thayer Greek Dictionary; over and above, more than is necessary, superadded, exceeding abundantly. Wow, that is our God! That’s the power He wants for us. The power to live life to its fullest, abundantly, lacking nothing, a healthy and vibrant life. He wants us to have His life. We still need to find that plug in, so to speak. How does it become available for us in our day-to-day lives? Let’s take a close look at Romans 1:16-17 NKJV. 16 For I am not ashamed of “the” gospel of Christ, for it is “the” (definite article) power of God to salvation for everyone who believes… 17 For in it “the” righteousness of God is revealed, from faith to faith; as it is written, the just shall live by faith. Here is where we begin to see and understand His power, plugged into our lives. There is only one gospel (the gospel), which is “the power of God,” and you plug into it through “the revelation of righteousness.” The revelation of righteousness will release the very power of God into your life. This revelation is a revelation of your true identity fully restored in your life in Him. This has already been done at the cross, your belief in this revelation is where your life really begins. To believe and receive this revelation of righteousness, is to be fully persuaded that it is true, and that you are qualified to have it. If you have to “earn” (in any way, shape or form) by performing, then you will always question if you have “done enough” to fulfill the requirements to qualify. The performance requirement produces doubt! Righteousness reveals His life in you! What you believe will either propel you into His grace, or keep you bound in the law. Everything you do daily is based on your belief system. So if you believe right, you will live right, and experience His rest! Why is our innocence so important? Let me begin with this truth, if you have been forgiven of ALL your sins, then you are now innocent. Hebrews 9:26 …He has appeared to put away sin by the sacrifice of Himself. And Hebrews 10:17 “Their sins and their lawless deeds I will remember no more.” At the cross you were once for all forgiven, made righteous (innocent) by His grace, you didn’t earn it, you didn’t merit it, it is a gift, so receive it. God wants us to reign in life, and we need the revelation of righteousness revealed for the power of this gospel of grace evident in our lives. Peter felt it was important to remind the saints of their forgiveness in 2 Peter 1:9 and he told them they became shortsighted even unto blindness because they forgot that they were forgiven. He even pointed out in verse 12 the fact that these saints were established in this present truth. Friends, most notably the number one thing we so quickly forget, is that we are forgiven, therefore innocent. Whenever we feel ignored or neglected, self condemnation quickly follows. Why is this so important? Because when we forget we are innocent, we begin to condemn ourselves, falling back under the law, the ministry of condemnation. (2 Corinthians 3:7&9) Jesus was condemned at the cross, so that you wouldn’t be. He became sin so that you could be the righteousness of God in Christ. The sin debt was paid, you are now innocent! Receiving His revelation of righteousness also includes understanding God’s intense love for us. He loves us no matter what, His love never changes. Sometimes we forget , or feel ignored or neglected, and after some self-condemnation we try to become righteous by our works ( self efforts) in order to qualify for His approval and blessing. Our efforts bring us to a place of denying His power, by trying to produce the formula to bring about that which we desire. I believe that is the form of godliness but denying the power that 2 Tim 3:5 speaks of. “Form of godliness” meaning people appear to be godly. “Form” in that verse according to Thayers Dictionary means formula, suggesting a formula or steps to take to achieve godliness; but we deny the power which is righteousness by faith, apart from works, ( or working our own formulas.) Mixture tells us to add works, as in a formula in order to become righteous. There is nothing to complete, Jesus finished the work, we are already righteous. Grace deactivates pride. We want to be in control, instead of resting in His finished work. There is nothing for you to do but believe. When we have His life, understanding who we are in Christ, (righteousness revealed), we have that power in our lives. This revelation of righteousness is where we see the power of God released in our lives. It is by grace not works. So discover all the riches of His gift of righteousness, receive His abundance of grace, and reign in life today! Posted on May 15, 2013 Author EvanCategories Abundance of GraceLeave a comment on How To “Plug In” To The Power Of God In Your Life! Either you have been made completely complete in Him, or there is still some work to be done. If there is still work to be done, then there is still sacrifices and offerings to be made, so that we can show God that we are doing our part. You are COMPLETE in Him, through the finished work of the cross! NOTHING left for you to do! This is pure 100% undiluted grace! He does not desire, nor want our sacrifices, or offerings of any kind. (Heb 10:8-10) He simply wants us to believe the truth. Jesus is our once-for-all offering for everything! There is no more obligation, Jesus fulfilled our obligation. …What must I do? Believe in the one whom He sent. Our doing, is to believe. What You Believe, Shapes Your Entire Life! Your life is born out of what you believe. In other words, if you believe right, then you will live right. What you believe will either propel you into His grace, or keep you bound in the law. EVERYTHING you do daily, is based on your belief. We develop religious rituals based on what we believe, and we can also be set free, completely free, simply by believing what Christ has done for us at the cross. If you believe that God is mad at you, or dis-pleased with you, then your belief will birth a life in you, with religious rituals, based around that perverted belief. What you believe matters. In this message Evan teaches how what you believe shapes your entire life, and if you believe right you will live right. To watch the video, click on the video icon. Posted on May 7, 2013 September 16, 2016 Author EvanCategories Grace Audio/Video MessagesLeave a comment on What You Believe, Shapes Your Entire Life! 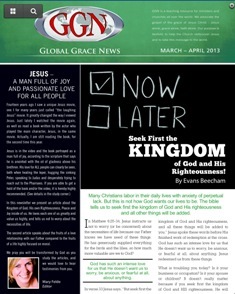 The March-April 2013 Global Grace News, newsletter has been posted, to view this edition, please click on the picture icon of the newsletter for the web PDF version. Again some great articles, including one I wrote titled: “Seek First The Kingdom Of God And His Righteousness.” You can Also access Global Grace News by clicking here: Global Grace News. You will be blessed! God’s richest blessings are already yours, reign in life today!